These delicious Healthier Thin and Crispy Salted Chocolate Chip Oatmeal Cookies are lightly sweet with a hint of sea salt. They're packed with nutrients from ingredients like whole wheat and almond flours, as well as chia and flax seeds. But they've still got all the buttery, chocolatey goodness you want in a cookie! My Healthier Thin and Crispy Salted Chocolate Chip Oatmeal Cookies provide exactly what I want in a cookie: buttery crispness, a hint of caramel, and an ever-so-slightly chewy center. The hint of sea salt highlights the buttery taste; the contrasting sweet and savory flavors actually helps to heighten the sweetness. I know many people are drawn to thick, chewy cookies but I'm all about a lacy, delicate, crunchy cookie. And, you know what? When I serve these, people go nuts for 'em! So, maybe everyone just hasn't had the right crispy cookie yet..? While these cookies certainly aren't health food, they are healthier than most and do provide quite a bit of nutrition. The old-fashioned rolled oats are a great source of iron and lend a wonderful texture to these cookies; white whole wheat flour adds fiber and protein; almond flour is a great source of magnesium, calcium, and protein; chia and flax seeds give a nice dose of omega-3s. But, here's the thing: these Thin and Crispy Salted Chocolate Chip Oatmeal Cookies still taste like dessert and they still feel like a treat. "Healthier" doesn't mean they're not delicious! In a large bowl, cream together the butter and sugars until smooth. Beat in eggs one at a time, then add the vanilla. Combine the flours, baking soda, and salt. Stir the flour mixture into the creamed mixture until just combined. Mix in the oats and chocolate chips. Scoop by heaping tablespoons onto a parchment-covered baking sheet. Leave plenty of room between the cookies, as they will spread (that's how they get all thin and crispy!). I put eight cookies per sheet: three on the top row, two in the middle, and three again on the bottom row. Gently press down on each scoop of dough to lightly flatten it, just a bit. Sprinkle a few grains of the coarse sea salt over each raw cookie. Bake one sheet at a time, for about 11-13 minutes; rotate your baking sheet halfway through. The cookies should be golden across the top, with crisp edges. Remove from oven and place the baking sheet on a cooling rack. Allow the cookies to cool completely on the sheet; they're really too delicate to move while still warm. If you're reusing your baking sheets, make sure the sheets are completely cooled before placing dough on them for the next batch. By the way, don't try to swap out the old-fashioned oats for instant oats—you will lose all that glorious oat texture and they will just not work! Check out some of our other healthier cookie recipes! This post contains affiliate links, so I make a small commission if you purchase through my links—your support helps to keep this blog running. i love any chocolate chip cookies!!! I'm loving your wonderful healthy recipe. I can't wait to give it a try. They look so beautiful and are a delicious treat for holiday guests. Oh my heavens these sound AMAZING!!!! I want these on my plate, right now! These are perfect. I love cookies in general but a crispy one has a special place in my heart. Delicious thin and crispy cookies! These look tasty and healthier. A great way to keep your waistline during the holiday season. These look so good. I love a nice healthy oatmeal cookie like this! With chia and flax seeds, these cookies are guilt-free, healthy and delish! Perfect with my morning cup of tea! Chia in cookies is a new idea for me. Do you use them instead of fat? I use coconut oil in cookies and flax. Interested to know how this recpe works. Might have to try it out! Looks fabulous. 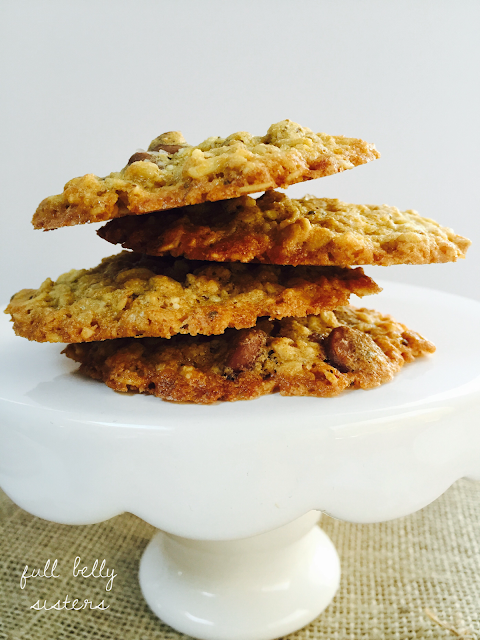 sometimes a flavorful crunchy cookie is just the ticket! I bake with coconut oil and flax regulary. The chia is a new twist! I'll have to make these and give these crispy beauties some room in my cookie jar! I love delicate lacy cookies, too. These sound great with the chia and flaxseed! These lacy cookies are just beautiful. Love the use of oatmeal...YUM! You had me at salted caramel. I love oat cookies too. YUM! I could use one or two or even three of these with my coffee right now! YUM! I love that they are thin! Yum, these cookies look so perfectly crispy! !